From Thailand, there are two ways to get to Cambodia. Well, maybe three if you count a boat, but I don’t know anyone who’s done that so let’s stick with either flying, or taking ground transportation. I looked into flying, but for me and probably most others living on a Thai teaching salary, it’s ridiculously expensive. 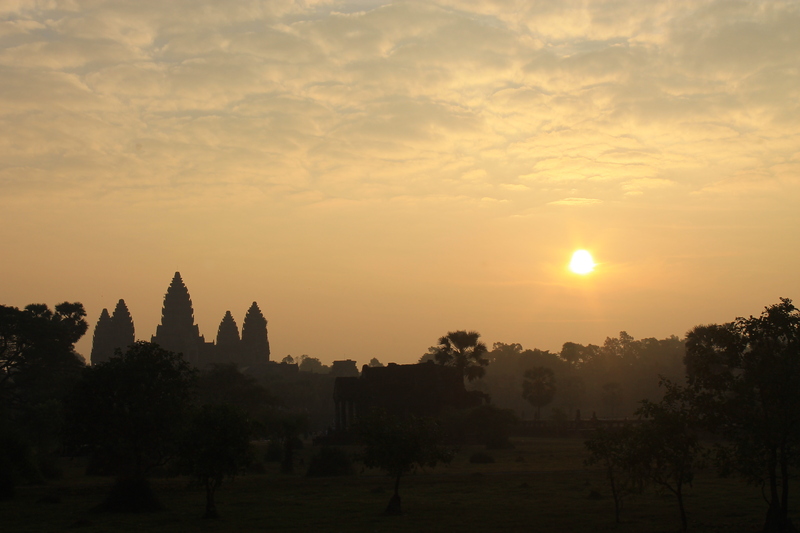 There are some cheap flights into Phnom Penh, but that wasn’t really going to be the focus of the trip, and flying into Siem Reap just didn’t make fiscal sense. I’d only heard horror stories from friends about the long and hellacious trip to get from Thailand to Cambodia but because it made the most sense, we decided to go for it. If you’re starting in Suratthani, the first thing you’ll have to do is get to Bangkok. To me, it made sense to get the whole trip over with in one go, so I took a night train, but if you want to burn a night in Bangkok you can always take a day train. The night train, depending on whether you get a sleeper, will set you back anywhere from around 570 – 700 baht. There are five or six trains leaving Phun Phin every night from 5pm to 8pm and these will get you into Bangkok’s Hualumphong station around 6 in the morning. And now for a friendly reminder: trains in Thailand are always late. I’ve been one some that arrive within 20 minutes of the time stated on the ticket, and some that have been as much as 5 hours late, so always just give yourself a lot more time than you think you need and plan accordingly. Once in Bangkok you now get to choose between taking a train or a bus from Bangkok to the border town of Arranyapathet. If you choose to take a train you can hang out at the station until the next one leaves. There are all sorts of very friendly information people milling around in neon shirts that speak fantastic English and will be able to answer any questions you have. I was told the next train was leaving for Arranyapathet at 1 in the afternoon and didn’t fancy spending 6 hours at the train station, so I opted to take a bus. If you choose to take a bus you’ll have to get yourself to Bangkok’s Northeastern Bus Terminal which is called Mo Chit. From Hualomphong you can either take a taxi or hop on the subway. At around 40 baht, the subway’s probably a little cheaper and you can ride this to the second to last stop where you’ll get off and then catch a quick ride via taxi at another 40 baht to the bus station. Just tell the driver Mo Chit, and you’re golden. Once at the bus station you can ask at the information kiosk for the booth that sells the tickets to Arranyapathet or just look around, it’s pretty much straight ahead and center against the back wall when you walk in the main doors. There are buses leaving through the day starting at 6AM and finishing around 5PM and a ticket will run you 212 baht. It’s supposed to be a 4 hour ride, but the two times I rode it took somewhere a little over 5, which still isn’t too bad because it proved to be one of the nicer buses I’ve taken in Thailand. The air conditioning worked, the seats reclined, and the speakers were only pumping Thai pop music for somewhere between 30 and 40 percent of the time. At the end of this ride the bus will kind of unceremoniously dump you off in the middle of what looks to be a nowhere town. Tuk tuk (little truck taxis) drivers will accost you asking you if you’re going to the border. Try hooking up with some other people heading that way to get a better fare. It’ll be somewhere between 50 and 60 baht. Now here’s the sneaky part. The tuk tuk drivers WILL take you to the border, but only AFTER they take you to one or two places where shady people will try to sell you visas at an inflated price. Just insist on being taken to the actual border, and don’t listen to a word they have to say. People were telling us all kinds of garbage about how if you don’t already have it it’ll cost more at the border, or that we couldn’t get the visas at the border that particular day and on and on. Just stay strong and don’t get out of the tuk tuk until you’ve arrived at the border. You’ll be dropped off a little up the road from the border station, so just get your stuff and start walking. Because gambling is illegal in Thailand but not in Cambodia, you may pass signs warning that leaving the Kingdom of Thailand to gamble is in no uncertain words, a bad idea and may lead to fines, and I’m not joking, death. Whether that’s the intention of your visit to Cambodia or not, you will pass through a Thai border building where it seems like smiling will get you thrown into prison. After this continue on you’ll come upon a Cambodian border checkpoint. You’ll have to fill out some paperwork, present your passport and a passport photo (don’t forget the photo and make sure you have at least a full empty page in your passport), $20 U.S. dollars and within a few minutes you’ll be on your way with a 30 day Cambodian tourist visa. These guys will try to tell you that you need to pay them $5 or a 100 baht extra to get it quickly, but stay firm, point to the sign above the window stating the price and don’t take their crap. From here it’s a matter of deciding whether you want to take a bus or a taxi (read 1982 Carolla driven by an insane and just maybe half blind Cambodian person) to your ultimate destination. I was heading to Siem Reap and was able to get three other people together to split a taxi with at $12 U.S. a person for a three hour ride. If you choose to take a bus, the tickets were around $9 U.S. and I’ve heard it takes significantly longer than a taxi, but if you’re traveling alone, it’s probably the cheap option. Hooray! You’ve done it. You’re in Cambodia. 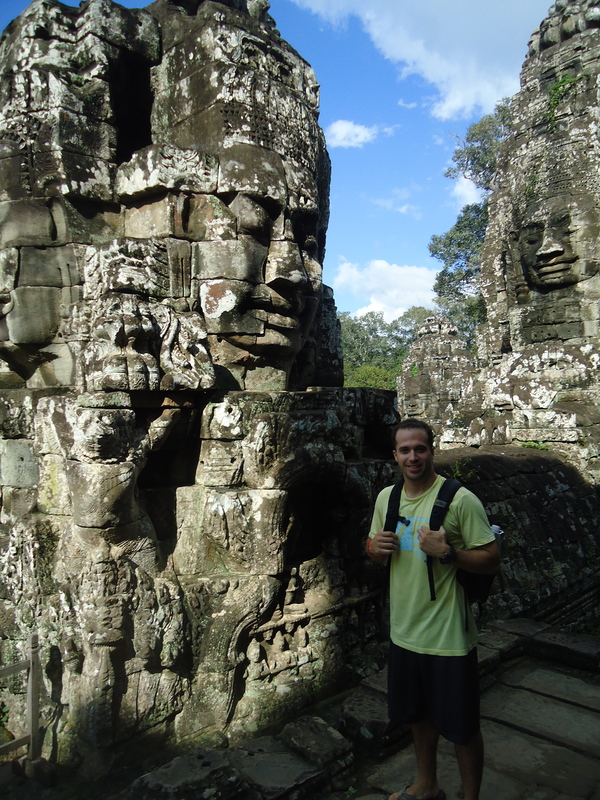 Go check out Angkor Wat and Phnom Penh and all the other goodness the country has to offer. You can shoot large automatic guns, and if you pay enough, it may just be possible to shoot a cow. Seriously, it’s like the Wild West out there. Getting back is essentially the exact same process in reverse. Take a bus or taxi from whatever Cambodian city you end up in to the Thai border and find a bus or train to get you back to Bangkok or wherever your next destination is. Just walk towards the busses lining up and hop on the next one leaving. I left Battambang, Cambodia at 7AM, got to the border around 10AM, caught an 11:30AM bus right across the border to Bangkok, got into Bangkok around 5pm and then was able to get a taxi from the Northeastern Bus Terminal Mo Chit to Hualomphong where I was in time for a 7:30PM night train leaving Bangkok for Suratthani. There you go. Happy travels.